This week's TWD recipe was chosen by Clara over at I Heart Food For Thought. 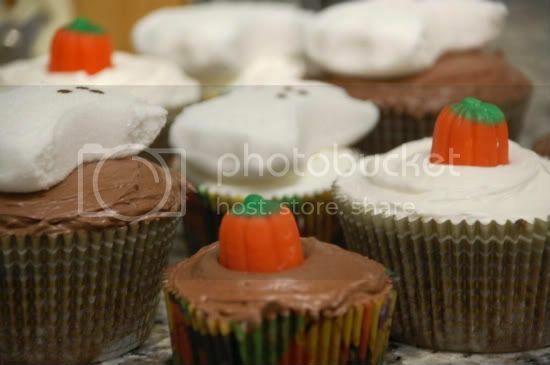 Clara chose Dorie's chocolate chocolate cupcakes which were a perfect excuse for me to make Halloween-themed cuppies! I really wish I spent more time on these but I did so much baking and cooking this past week, as mentioned in the previous post, that I really just wanted this recipe to be as simple as possible. On Thursday I plan to remake these and get really creative with the decorating. Anyway, these cupcakes were OK. Unfortunately, I've had way better chocolate cupcakes than these. While I under baked them by 5 minutes, I still found them to be a tad bit dry and not as tasty as I would have preferred for your typical chocolate cupcake. I personally prefer a moister less dense cupcake. These were almost brownie-like. Therefore, on Thursday, I'm going to test out another chocolate cupcake in hopes of achieving just that--a moist chocolaty rich cuppie. Stay tuned! i love ghosts--cute! looking forward to seeing your next cupcake on thursday! Cute cupcakes! Sorry they weren't your favorite - I am also still searching for that perfect chocolate cupcake recipe. Hehe - I love the ghosts, they're too cute. Since you weren't a fan, I look forward to your other cupcake! Adorable marshmallow ghosts! Bummer it was dry for you but thanks for baking with me this week! So fun! I love the peeps and pumpkins. Perfect for Halloween! Simple but cute! I look forward to your cupcake experiments -- still looking for that "perfect recipe." So cute! My nephew's going to be a ghost for Halloween. He'd love these! Is that a ghost peep? So cute! Sorry your cupcakes were dry but they look so cute! Love the ghosts! These came out absolutely adorable! very creative! 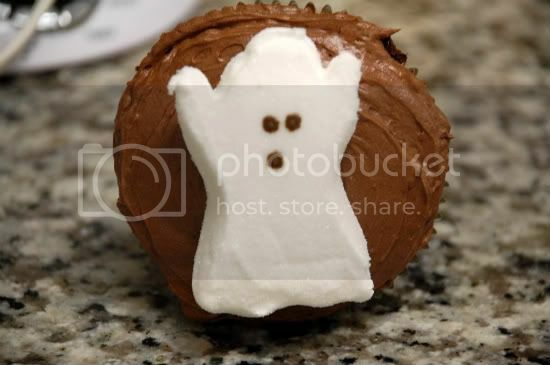 Those little ghosts are so cute, I wish I could have found some! Your cuppies look delicious! The Best Chocolate Chip Cookies...Ever! IRON CUPCAKE EARTH: CHEESE-Vote for Me!